Inishturk (Inis Toirc in Irish), Wild Boar Island, has been inhabited on and off since 4,000 BC. In its present phase, it has had permanent residents since at least 1700. Whereas its population before the Famine was close to 1000, it has a permanent population of only about 70 residents today. 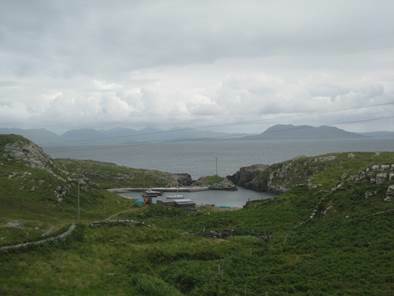 There are two main settlements, both on the eastern end of the island – Ballyheer and Garranty. The Community Club called the Mountain Common sits on the hill between the two villages. It is the centre of all social life on the island. Since the famine in the mid-1800s, Islanders have been emigrating to America and England to find work and fortune, although now people are returning to spend their retirement years in its embrace. So whereas Irish was the first language at the beginning of the 20th century and although Gaeilge is still widely spoken, the island is now primarily English speaking. 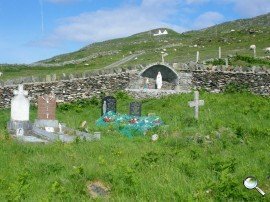 Situated between Inishbofin and Caher Island about 14.5 km (9 miles) off the coast, Inishturk is a small (5 x 2.5 km) and beautiful island. Geologically, Inishturk was formed by two separate folds of schist and shale that rise out of the Atlantic as a continuation of the same folds that formed Croagh Patrick on the shores of Clew Bay in County Mayo. 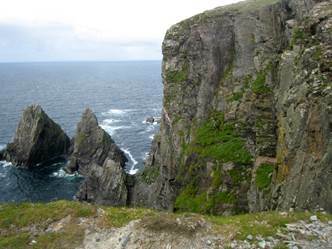 It rises boldly from the wild North Atlantic as cliffs to the northwest and steep hills to the north. The southern shore slopes gently down to the sea, where rocky outcroppings punctuate pristine white sand beaches. Life on the islands can be quite challenging through the winter months. In the summer, their populations tend to swell with tourists clamouring to experience island life. Culturally, Inishturk offers a rare glimpse into island life not yet spoiled by tourism and hopefully to remain so for the foreseeable future. Life is real here. 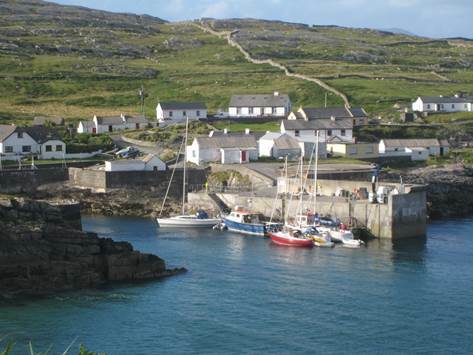 Inishturk has a lovely harbour with a new pier and several secure visitor moorings, which tend to be a bit exposed. If coming by boat, there are four visitor moorings. 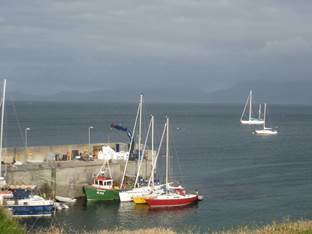 Visitor moorings are free of charge and maintained by Mayo County Council. 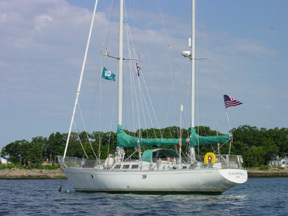 Yachting Monthly included Inishturk among the handful of locations in the “UK” with favourite visitor moorings. There is often room to tie up alongside the fishing boats on the pier. It is critical to ask permission as the fishermen may be heading out during the night. Do not obstruct the ferry approach, which makes the trip twice a day. If you don’t have your own boat, you can still visit Inishturk via ferry. In the summer (01/05-09/30), O’Malley Ferries have twice daily sailings from Roonagh Pier near Louisburg on most days. There are few services for visitors, so self-sufficiency is key. The only real gathering place on the island is the Community Club. There is a small shop with very basic provisions and a library with internet access. Showers and toilets are available, as is a lovely bar with stunning panoramic views. The walk up to the Centre can be a bit strenuous up the hill and around the harbour. Chances are there will be someone at the pier to offer you a lift if you so choose. The islanders are very welcoming. Walking is perhaps the major activity and breathtakingly stimulating. 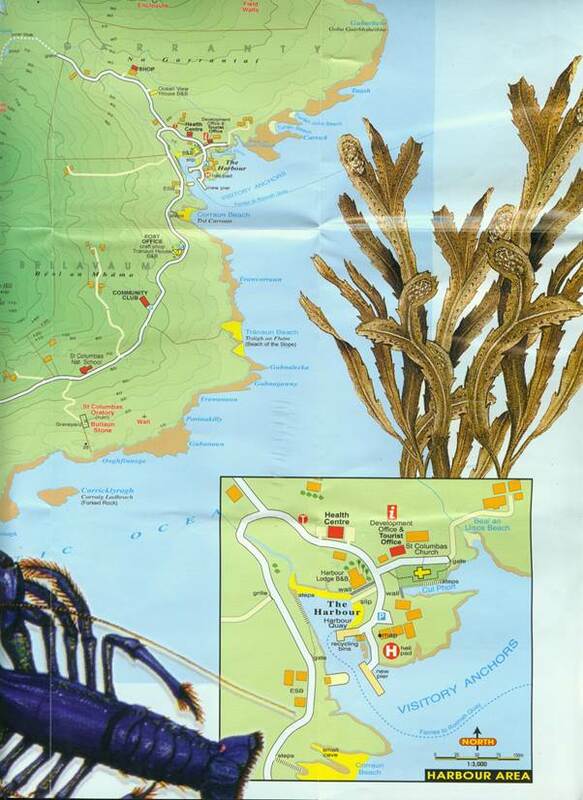 The natural scenery is among the finest and the island has many interesting archaeological sites. 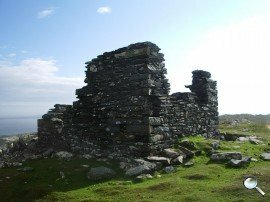 The old church up on the hill was in use in the penal times dating back to the sixteenth century. The cemetery was a pagan centre before it was used as a graveyard as the 1838 map shows a stone circle indicating its pagan origins. The little oratory is in the shape of a coffin and holds a holed stone for healing and marriage rituals. Apparently, the oratory originally had a corbeled roof. Walk up the hill from the harbour past the church and new medical centre through Garranty and continue out past civilization onto the commonage. Open a gate and walk onto land that appears untouched by humans with the exception of a lightly travelled road across the moors. Climb the gentle slope until you come to an opening between two hills with a lake appearing to the left. A number of Beehive house sites situated around the lake area date to circa 1500 BC. A beautiful valley between two rises and lovely lakes makes for an idyllic and sheltered if not isolated spot to take a break. Set out across the hills, walking on the soft heather. At the top stand the ruins of the old signal tower 722 ft above sea level. The Martello tower was built 1805-1806 as one of 82 towers erected by the British along the west coast finishing on Malin Head. Inishturk was number 57. The men in the watch towers intended to discourage Napoleon by using a heliograph or steel plate polished to reflect the rays of the sun to passing ships. 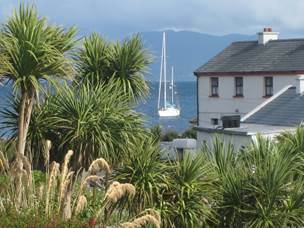 Here you will be rewarded with breath-taking 360 degree views across to Mayo on one side, the islands off the coast in the other direction, and the hills of Connemara in the third direction. At the crest, the winds blow insistently even on a calm day. The best activities for visitors involve taking advantage of the natural environment of flora and fauna on shore and in the sea. Ornithology enthusiasts will be thrilled by the number of bird sanctuaries on the island cliffs. The flora of Inishturk is of international importance, harbouring rare endangered species such as the Spotted Rock-Rose. Set off across the valley and make your way across wet lands via a rudimentary bridge built by the farmers of the commonage. Skirting the next set of peaks you come across a beautiful rock precipice straight down to the sea. The cliffs form a crescent shaped inlet. They are alive with birds protecting their nests and feeding their young. The island is a breeding ground for Fulmars, Guillemots, Black Guillemots, Razorbills and the charming Puffins. The best time to view breeding seabirds is from May to July. The locals claim this is the place to be for the best views of sunsets in Europe! Heading back toward the main harbour, you come to the beautiful snippet of a harbour at Portdoon, which seems carved out of the rock with an impossibly treacherous slit between the rock walls as an entrance, hence the name (Port An Dun). 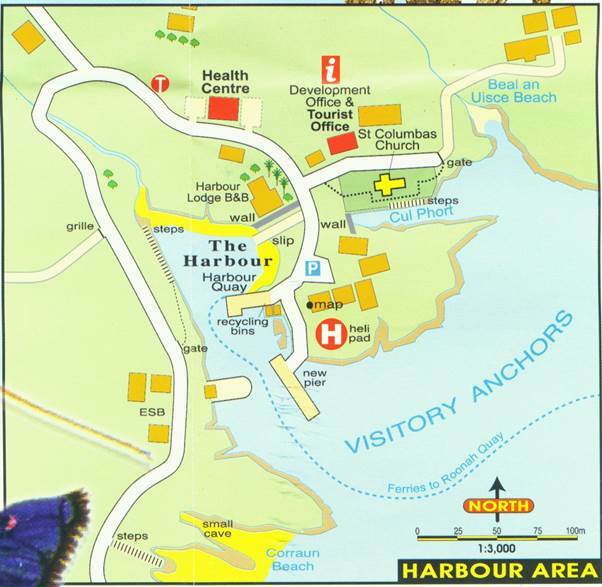 There is ample archaeological evidence of early settlers around this harbour, the only natural lagoon on the island. Many recent settlers have congregated at the southwest corner in the village of Ballyheer. Tradition suggests that the harbour was used by the Norse men way back in time. The pirates harboured their galleys in the lagoon below, screened by the rocks from the observation of those sailing past. They were reputed to be the last Danes in Ireland who knew how to make bier lochlannach, a priceless drink made from heather. Legend has it that the fort was surprised and taken by the Irish, who slaughtered everyone except for one old Dane and his son, offering to spare the captives if they told the secret of the bier or, as others have retold, the hiding place of their vast treasures collected as plunder over many years. The old pirate, fearing the boy might be tempted or tortured into betrayal, offered to tell if his son was put to death first so none of his kin might see his treachery. This done, the pirate captain tore away from his captors and jumped over the cliff into the deep chasm shouting insults and carrying his secret to Odin. 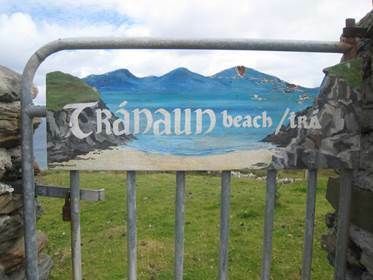 On the eastern side of Inishturk are the secluded Tranaun and Curran beaches, with fantastic clear blue waters, ideal picnic and swimming spots after a hike. Scuba diving in the Caribbean blue, crystal clear waters is a joy as the waters abound with lobster and large crabs as well as fish of many varieties. 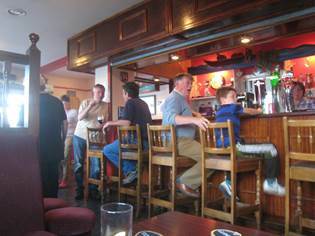 For the full island experience, round the day off with a pint of Guinness in the island's lively Community Centre. Most weekends you’ll find live traditional music and dancing till the wee hours. Well known for its traditional music and set dancing sessions, Inishturk’s annual trad festival is not to be missed. Visitors are very welcome. A festive event held annually consists of live music on the pier to accompany currach races. Islanders from surrounding islands participate and there are land-based events on shore as well. The day culminates in a live music celebration at the Community Club. Every year, a variety of sporting events are held (bag race, egg & spoon race, shoot outs, etc) which culminate with a now historic islands football match. 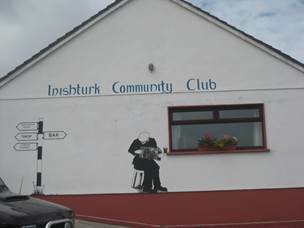 Inishturk was the winner of the 2008 All Ireland Islands Championship. The football pitch is one of the most amazing as it is carved out of the solid rock. Caher Island is a mystical uninhabited island close to Inishturk. It is only possible to land there in calm weather as there is no sheltered harbour. The island has the ruins of an early Christian monastery and the remains of a chapel adorned with 7th century carved crosses. 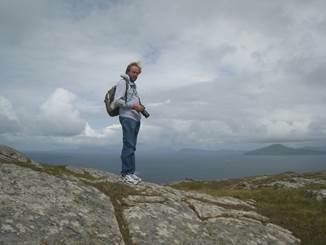 The Island also seems to have contained the hermitage sites of seventh century monks, perhaps followers of St Columba. 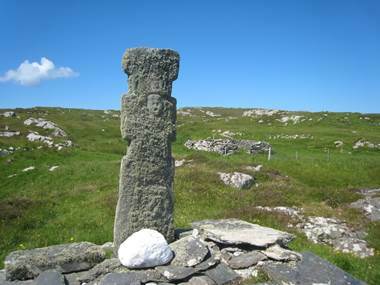 It is accessed by boat from Inishturk. There are three B&Bs on the island. There are no restaurants other than the B&Bs. The Community Centre serves meals on some weekends and offers a campground as well as showers and toilet facilities. 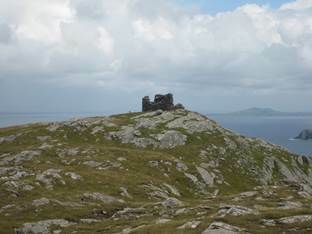 Remains of signal tower number 57 atop Inishturk affording 360 degree views of the surroundings.